Prayer of Kuntuzangpo (Tib. ཀུན་བཟང་སྨོན་ལམ་, Kunzang Mönlam; Wyl. 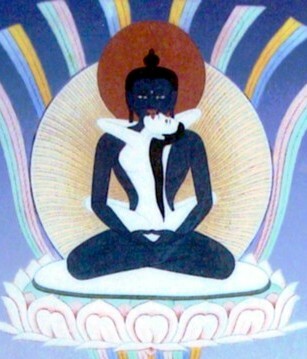 kun bzang smon lam) — a famous Dzogchen aspiration prayer from the Gongpa Zangthal. It is to be recited especially during a solar or lunar eclipse, an earthquake or at the solstices. ཀུན་བཟང་སྨོན་ལམ་གྱི་དོན་འགྲེལ་ཉུང་ངུ་མཆན་བུ་། བྱང་གཏེར་དགོངས་པ་ཟང་ཐལ, kun bzang smon lam gyi don 'grel nyung ngu mchan bu / byang gter dgongs pa zang thal, 15th Karmapa, gsung 'bum, Vol. 9, p. 495. A partial translation into German is available in Samantabhadra Dzogchen-Gebet, s.b. ཀུན་བཟང་སྨོན་ལམ་གྱི་རྣམ་བཤད་ཀུན་བཟང་ཉེ་ལམ།, kun bzang smon lam gyi rnam bshad kun bzang nye lam/, gsung 'bum, Vol. 1, p. 391. Gangteng Tulku Rinpoche: Samantabhadra Dzogchen-Gebet. Khampa-Buchverlag, Osterby, 2000. This translation of the Kuntuzangpo-Prayer contains a partial translation of the commentary by the 15th Karmapa. The Amnesic Monarch and the Five Mnemic Men: Memory in Great Perfection Thought. An article by Matthew Kapstein in the book In the Mirror of Memory, Articles by Buddhist scholars, collected by Janet Gyatso. Sri Satguri Publications, ISBN-81-7030-374-5. pp.239-269. This page was last edited on 18 December 2017, at 11:57.